During the month of August, various church activities were held at our branch churches throughout the nation of Burundi, spread across the country from north to south. In the course of the four week campaign, souls were saved and sanctified, and many were healed. 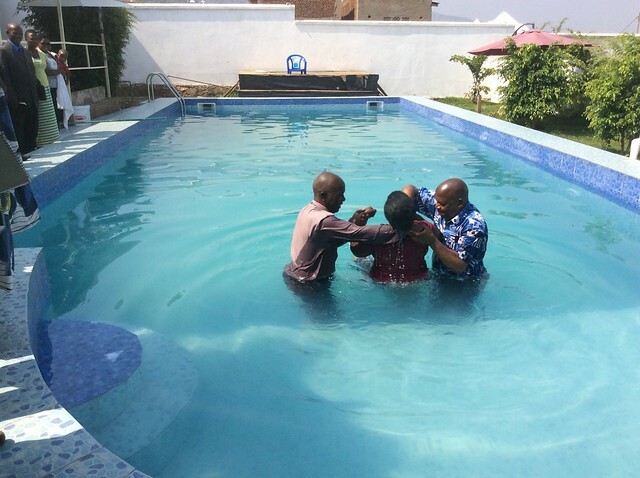 One of the most memorable events was a water baptism held last week in the Cibitoke region for five brothers and two sisters. There were others who wanted to be baptized but could not obtain leave from their places of employment; however they were advised to be ready for the next baptismal service. Two of the candidates were a husband and wife who had been saved and then water baptized on the same day. It was wonderful! After a farewell service in one of the outreach areas, individuals were still happily talking to each other in front of the gathering hall when it was decided to take a group photo. It was a special time that will not be soon forgotten. We pray God will continue to bless the people of Burundi.